Sometimes, we get so wrapped up in our lives that we forget about the little things and, more importantly, how the little things aren’t so little to a shelter dog. As it was with most of us, I had a hectic weekend, and my dogs didn’t get the attention that they were used to. To make up for it, my daughter and I decided to take our dog, Gidget, for a walk. I remembered noticing that a dog named Sparky at my local shelter, where I am a volunteer, was showing signs of kennel stress. He had gone through a couple of surgeries during the past weeks due to a complication with his neuter, and so he had been kenneled a lot more than usual, and it was starting to wear on him. So, I figured that we would pick him up and take him along with us. We live along the Chesapeake Bay, so I thought that would be a good place to take the dogs out. Sparky was an inner city boy. He came from the streets of DC where he was found as a stray. Sparky had probably never been to a beach before that day. So, imagine his surprise when I got him out of the car and there it was! 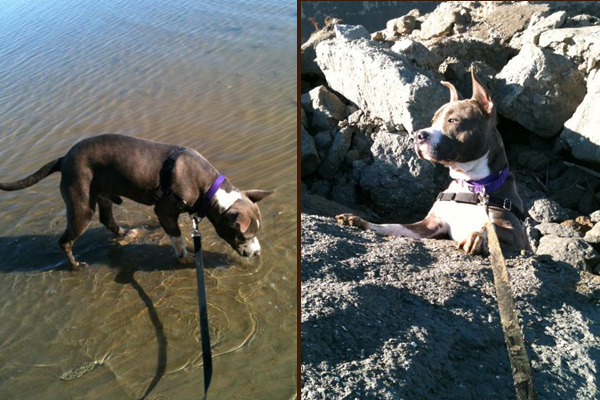 Water, waves, sand and so many new smells! Oh, there was so much to sniff out! Sparky found old fossilized clams and seaweed. Sparky found pieces of driftwood that had washed up! 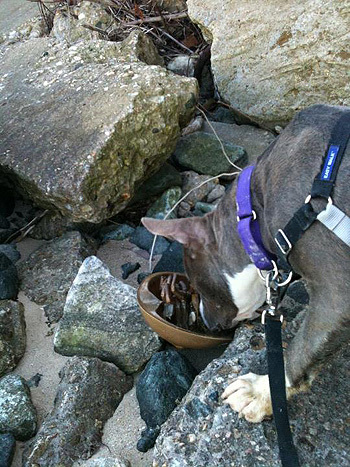 Sparky even found horseshoe crabs! And all the time, he kept looking back at me with an expression that clearly said “Woah! Do you see this? !” Not to mention, he also sniffed our dog, Gidget. Sparky might possibly be in love, I thought – sorry buddy, you’re both fixed. It was a nice little reminder. Most of us down here along the bay make trips to the beach frequently. The bay is no longer new or really exciting to us. And most of us, myself included, would never be excited about the possibility of sticking our noses in a horseshoe crab and sniffing. But to Sparky, this was such a new and wonderful experience. This was quite possibly the best day of his life, and it was such a simple thing – it was just a little over an hour out of our day, and we were going anyway. But to Sparky, this was so much more than just a trip that we were going to take anyway. This was an adventure, and all the stress from multiple surgeries just melted away. So, next time you’re out, be it at the Chesapeake Bay or elsewhere around your home, remember to take a note from the book of Sparky. Remember to notice the little things, and enjoy them. Remember to stop and smell the horseshoe crabs, and don’t take the little things for granted. And if you can do so, take a shelter dog. It’s amazing how something little like that can make a shelter dog’s day. 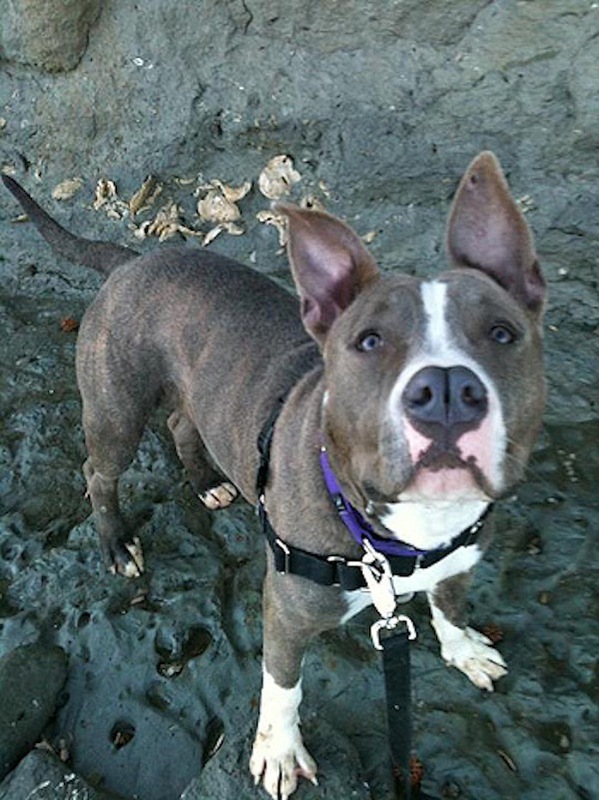 By the time this article was originally published on April 9, 2012, Sparky had found his forever home with a little girl that he absolutely adores.